OMEGA’s PX921 Series Wireless Transmitters & Receivers System is designed for safe operation in tough industrial installation - without the need for hard wiring! The PX921 operates by radio telemetry. 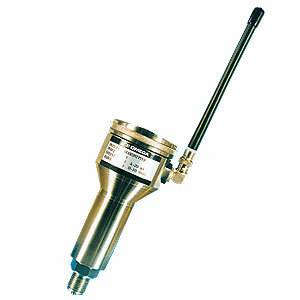 A low power RF transmitter safely transmits the signal up to 500 feet to a receiver / retransmitter where it is converted into a 4-20 mA signal. Rugged stainless steel construction featuring S.O.S. technology with a custom IC amplifier give the PX921 series high stability, low drift and long life. SOS construction uses very stable solid state silicon strain gages on a Sapphire carrier which is glass bonded to a titanium diaphragm. This combination provides a very durable transducer which has excellent stability over a wide temperature range. Additionally, the titanium diaphragm and Stainless Steel wetted parts provide maximum durability and corrosion resistance to harsh industrial chemicals. The PX921 pressure transmitter converts pressure measurements to a digital code which is processes by the onboard microcontroller. The microcontroller generates a coded data frame in accordance with the protocol. This frame is then transmitted by UHF to the PX921-R where it is decoded, validated and converted to an analog 4 to 20 mA signal. This signal can then be transmitted and interface with all standard 20 mA loop instruments. Data is transmitted as a bit stream data frame using asynchronous protocol. a random delay between transmissions minimizes collisions between adjacent streams. Data error detection is employed to allow error free operation in high interference environments. Indication of receipt of uncorrupted data is provided on the PX921-R unit. No license is required with this equipment. Data transmission is via a radio transmitter operating at a designated low power UHF telemetry frequency. It operates in the 418 MHz region @ 0.25 mW. The PX921 is simple to install and does not require additional configuration tools. Once the PX921 has been connected to the process fitting, configuration is easily carried out by setting a series of miniature switches which are under the cover of the transducer. At this stage it is possible to check the calibration of the unit locally by measuring the voltage across tow test points, which can then be adjusted with the zero and span trimmers if required. POWER SUPPLY Units may be powered by either an internal battery (10.5 to 15 Vdc) or by an external supply voltage (10.5 to 30 Vdc). In battery mode, a duty cycle power saving system is employed to extend battery life.